One of the most common misconceptions about window film is that it will damage your windows. Many people believe that it will cause your windows to become foggy over time. With over 30 years of experience in the window film industry, the experts at Carolina Solar Security have the expertise to put this misconception to rest. The best way to not damage your windows is to choose the right film. Different films better suit some types of glass than others. Do you have single-pane, double-pane, or low-e glass? This dramatically affects how your windows respond to tint. 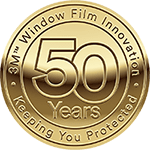 As a 3M Authorized Prestige Dealer, Carolina Solar Security possesses a wealth of knowledge about how to choose the right film. Regardless of what type of glass your windows are, there is a window film that is compatible. You just need an experienced window film installer to guide you through the selection process and to apply the film for you properly. What Causes Windows to Become Foggy? Double-paned, also known as dual paned or insulated, windows always become foggy over time because their seals will eventually fail. When the seal fails, this allows moisture to collect between the panes of glass. The moisture condenses and creates the foggy appearance. This process — although unfortunate — has nothing to do with whether the glass is tinted with window film. So how did window film develop the reputation of making your windows foggy? When a double-paned window’s seal fails and the owner of the window contacts the manufacturer, the window manufacturer looks for any possible reason to attribute the fogging to besides the window itself to avoid having to pay to replace it. If the window is tinted, they say the tint contributed to the seal breaking, even though there is no evidence to prove window film was the cause. So will window film damage your windows? The answer is no when you select the right type of film for your glass and when it is applied properly by a 3M Authorized window film installer like Carolina Solar Security.